The major indices of the Indian stock markets were range-bound on Monday and ended flat over Friday’s close. On the NSE, there were 490 advances, 1,252 declines and 313 unchanged. Higher inflation data and caution ahead of Karnataka election results kept the key Indian equity markets subdued on Monday. India's wholesale inflation rate rose to 3.18% in April from 2.47% in the previous month, official data showed here on Monday. According to market observers, selling was witnessed in consumer durables, auto and capital goods stocks. The CBI (Central Bureau of Investigation) on Monday filed a chargesheet against some former and current bank officials and several others in the over Rs13,000 crore Punjab National Bank (PNB) fraud case allegedly perpetrated by diamantaire Nirav Modi and his uncle Mehul Choksi. The major indices of the Indian stock markets were volatile on Tuesday ended flat over Monday’s close. On the NSE, there were 580 advances, 1,117 declines and 349 unchanged. 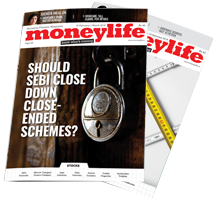 The key Indian equity indices erased all their early gains and were trading in the red zone on Tuesday afternoon. But, by the close of trading, the major indices recovered to end flat. Expectations of a BJP victory in the Karnataka assembly election had lifted the key Indian equity indices on Tuesday morning. But when Congress and Jana Dal (Secular) got together to form a coalition and stake claim to form the government, stocks fell. The major indices of the Indian stock markets suffered a correction on Wednesday and closed with losses over Tuesday’s close. On the NSE, there were 632 advances, 1,078 declines and 339 unchanged. 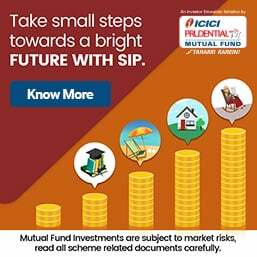 Uncertainty over government-formation in Karnataka, along with weak global cues, suppressed the key Indian equity indices on Wednesday. No party achieved a clear majority in the election results announced on Tuesday, leading to uncertainty over the formation of the next government. According to market analysts, selling pressure was witnessed in oil and gas and banking stocks. The CBI on Wednesday filed a second chargesheet in the Punjab National Bank (PNB) fraud case against diamond merchant Mehul Choksi and his Gitanjali Group's companies. The chargesheet was filed in a special CBI court in Mumbai, an official said. So far, 15 people have been arrested while Modi and Choksi are on the run. Tata Consultancy Services (TCS) said it has added more than 200 new employees in the US state of Arkansas, as part of its deal with insurer Transamerica. Britannia Industries Ltd., India's leading food company, reported a 25% increase in its consolidated net profit to Rs263.16 crore in the quarter ended March 31, 2018 as compared to Rs210.91 crore in the year-ago period. On a comparable basis, its revenue from sale of goods in the quarter under review, stood at Rs2,510 crore, up by 13% from Rs2,230 crore in the corresponding period the previous year. The biscuit maker reported a 14% rise in its net profit for 2017-18 to Rs1,004 crore. While the growth in the dairy business has been subdued due to its focus on driving value-added products and reducing its play in the less profitable commoditised products, profitability has improved considerably. 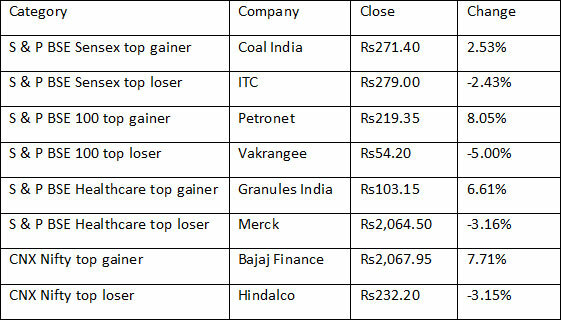 The major indices of the Indian stock markets closed with losses on Thursday over Wednesday’s close. On the NSE, there were 906 advances, 809 declines and 330 unchanged. Aditya Birla Group company Hindalco Industries reported a 25% fall in its standalone net profit for the quarter ended in March. In a regulatory filing to the BSE, the company said its standalone net profit declined to Rs376.97 crore during the fourth quarter of 2017-18, against Rs502.52 crore reported in the corresponding period of 2016-17. The total standalone income of the company for the quarter under review stood at Rs11,886.02 crore, down 0.7% lower than Rs11,969.66 crore earned in the same quarter of financial year 2017. For the financial year 2018, the company reported a fall of 7.73% in its standalone net profit at Rs1,436.49 crore. The board of directors have recommended dividend of 120% or Rs1.20 per equity share of face value of Re1 each for the financial year ended on March 31, the company said. The major indices of the Indian stock markets suffered a correction on Friday and closed with losses over Thursday’s close. On the NSE, there were 478 advances, 1,243 declines and 326 unchanged. The key Indian equity indices traded in the red on Friday due to weak global cues including persistent rise in crude oil prices along with selling in capital goods, banking and auto stocks. Sensex and Nifty 50 declined for a fourth straight session on Friday, following mixed sentiment in global stock markets, pointed out market analysts. Air conditioners maker Voltas Ltd reported a 3% fall in its consolidated net profit to Rs194.19 crore in the quarter ended March 31, 2018 as compared to Rs200.47 crore in the corresponding period last year. Total income for the quarter was at Rs2,092 crore as against to Rs2,098 crore in the corresponding period last year. The company said its consolidated total income for the year ended March 31, 2018 was higher by 5%, at Rs6,602 crore as compared to Rs6,307 crore last year, owing to improved efficiencies across businesses. The firm reported its net profit was also higher by 11%, at Rs578 crore as compared to Rs520 crore last year. The board of directors of the company has recommended dividend of Rs4 per share. The company’s shares closed at Rs552.75, down 5.22% on the NSE, on Friday. Reliance Power has divested its entire holding in Jharkhand Integrated Power Limited (JIPL) to Jharkhand Urja Vikas Nigam Ltd for Rs112.64 crore, a regulatory filing by the company said here. "The company has transferred its entire holding of 1,49,900 equity shares of Rs10 each, aggregating to Rs14,99,000/- held in Jharkhand Integrated Power Limited, a special purpose vehicle created for development of Tilaiya UMPP, to Jharkhand Urja Vikas Nigam Limited, the lead procurer, acting on behalf of procurers of Tilaiya UMPP," the regulatory filing said. According to sources, Reliance Power also got the bank guarantees of Rs600 crore released from the procurers. Reliance Power had announced the termination of power purchase agreement (PPA) of its 3,960 MW Tilaiya Ultra Mega Power Project (UMPP) in Hazaribagh district, in Jharkhand in April 2015. Based on tariff-based bidding managed by Power Finance Corporation (PFC), Reliance Power was awarded the Tilaiya UMPP in February 2009. JIPL, the Special Purpose Vehicle (SPV) for implementing the project, was handed over to Reliance Power by PFC in August 2009. JIPL had signed a PPA with 18 power off-takers in 10 states for 25 years. Reliance Power shares closed at Rs35.60, up 6.91% on the NSE. Birla Corporation Ltd, the flagship company of MP Birla Group, reported a 30% increase in its consolidated net profit to Rs131.12 crore in the quarter ended March 31, 2018, as compared to Rs100.89 crore in the year-ago period. Its income from operations during the quarter was at Rs1,650.6 crore, up 16% from Rs1,420.1 crore in the corresponding period last year. The cement maker said its earnings before interest, tax, depreciation and amortization (EBITDA) for the quarter were Rs284.1 crore, up 5% from Rs269.7 in the corresponding period of previous year. It said its cement sales for the March quarter stood at 34.1 lakh tonne, compared to 32.8 lakh tonne in same period of previous year, reflecting an increase of 4%. Its board of directors proposed a dividend of Rs6.50 per share and the total outgo on account of dividend, including taxes, works out to Rs60.34 crore. The company’s shares closed at Rs734.00, up 5.80% on the NSE. Aditya Birla Group company Hindalco Industries reported a 25% fall in its standalone net profit for the quarter ended in March. In a regulatory filing to the BSE, the company said its standalone net profit declined to Rs376.97 crore during the fourth quarter of 2017-18, against Rs502.52 crore reported in the corresponding period of 2016-17. The total standalone income of the company for the quarter under review stood at Rs11,886.02 crore, down 0.7% lower than Rs11,969.66 crore earned in the same quarter of financial year 2017. For the financial year 2018, the company reported a fall of 7.73% in its standalone net profit at Rs1,436.49 crore. The board of directors have recommended dividend of 120% or Rs1.20 per equity share of face value of Re1 each for the financial year ended on March 31, the company said. The company’s shares closed at Rs232.20, down 3.15% on the NSE. JK Lakshmi Cement reported a 62.3% rise in its standalone net profit for the quarter ended in March. The company said in a statement that its net profit for the fourth quarter of 2017-18 stood at Rs33.84 crore, against Rs20.85 crore reported in the corresponding period of 2016-17. However, the total income of the cement company in the period under review declined 0.78% to Rs923.32 crore, compared to Rs930.57 crore earned during the fourth quarter of 2016-17, it said. For the financial year 2017-18, the company reported a standalone net profit of Rs83.96 crore, 2.4% higher than Rs82 crore reported in the previous year. The company’s shares closed at Rs376.00, down 2.29% on the NSE. British Columbia, the Canadian province that is a leader in technology and has one of the fastest growing tech ecosystems in the world, is looking at a shortfall of 30,000 skilled individuals to fill tech-related jobs, with India as an important catchment area for recruiting immigrant talent. This is likely to give an impetus to the information technology industry in India to grow in exports to countries other than the United States and make it broad-based. The S & P BSE Information Technology Index closed at 13,250.20, down 0.10% on the BSE.